Ooooh la la! Brand New Vegan’s gettin’ all fancy now! Julia Child would be proud of this healthier take on a French favorite – Vegan Mushroom Bourguignon. 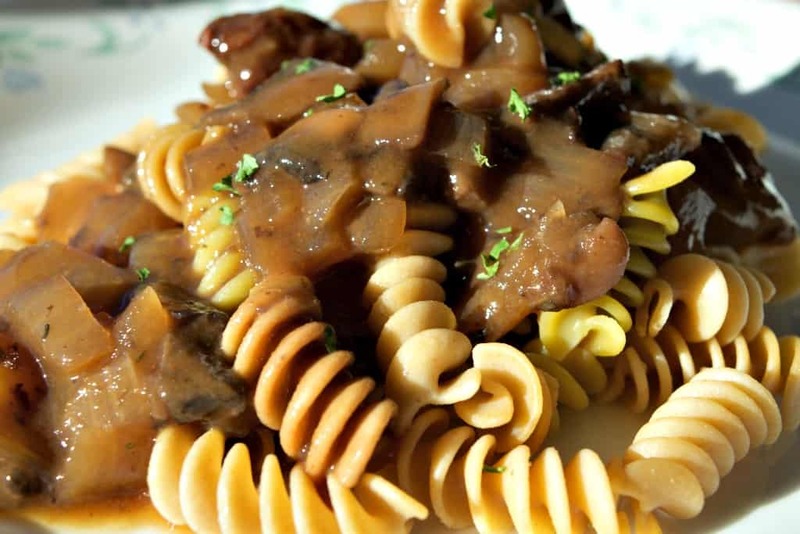 If you’ve never had Beef Bourguignon (or Beef Burgundy as it’s sometimes called), it’s a classic French recipe where a beef roast and mushrooms are simmered in a red wine gravy and served over egg noodles. In this recipe, I veganized it by replacing the beef with additional portabella mushrooms and chopped seitan. And let me tell you, this will impress even the pickiest meat eater. The gravy in this recipe is the bomb.com kind of good! This recipe is right out of Caldwell Esselstyn’s “You Can Prevent Heart Disease” book, with only a few minor tweaks to match ingredients I had on hand. Better light some candles for this one! In a large soup kettle, saute the onion and mushrooms in 1/4 cup of water until everything is nice and soft and reduced substantially in size, then add the Seitan. I usually chop up the pieces a little smaller before adding them to the pot. I use the Westsoy Brand of Seitan and can easily find it at my local Fred Meyers (Kroger). Cook for a few minutes then slowly pour in a cup of red wine. It just so happened I had a bottle of Zin which worked well, but any red wine should work. Of course, a Burgundy would be truer to the original French recipe. Then add the soy sauce, veggie broth, and spices and bring to a slow simmer. When the stew is bubbling, mix the cornstarch and water together and pour it into the pot. It should thicken nicely within a few minutes. Pair with your favorite pasta or rice and you got one elegant dinner. Thanks, Dr. Essy (or should I say Ann) this is one amazing recipe. A vegan version of a French classic. This Vegan Mushroom Bourguignon is a rich, decadent stew of mushrooms and seitan simmered in a red wine gravy. Serve over your favorite pasta or rice.